Welcome to X L Enterprises LTD. Manufacturer, Supplier and Exporter of Leather Goods The company was incorporated in 1991. We are an ISO 9001:2000 certified company. Ourproducts are supplied to over 200 retail stores in US. Timely shipments, Consistent quality, Rich industrial experience, dedicated team of designers & merchandisers make us superior from others. Our product list includes Luggage, Leather Goods, Designer Collection, Magic Wallets andLeather Handbags. Our Leather & Billfold ID Leather Wallets are widely acclaimed in the market. We provide Leather Ladies Wallets that are available at affordable prices. 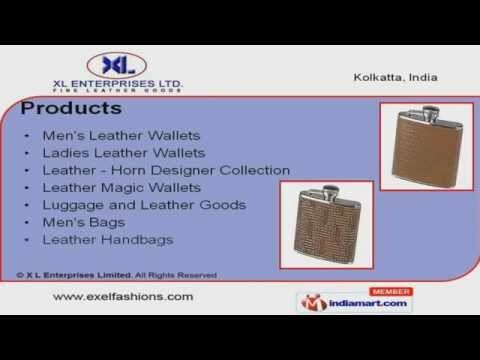 Mens & Ladies Leather Wallets - Horn Collection is best in the industry amongst others. Our Original Magic Wallets & Z Folds are a class apart. Leather Business Card Holder & Letter Rack is the USP of our company.